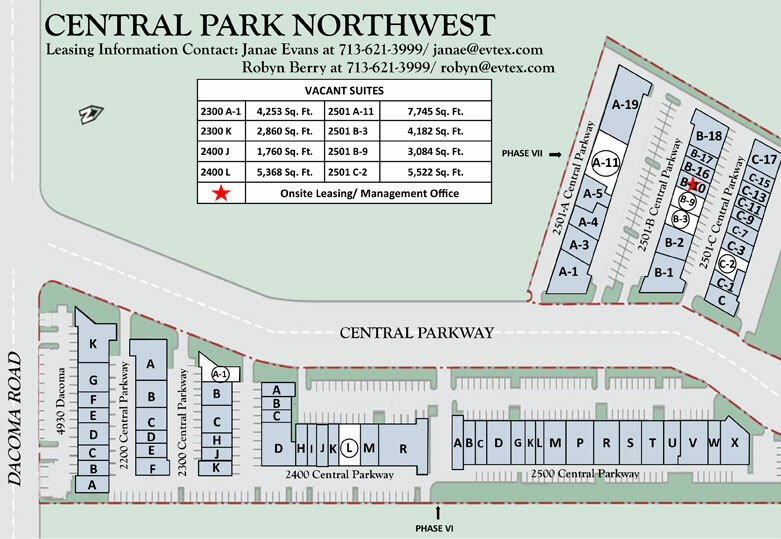 This 291,410 SF complex in Northwest Houston features grade level and dock well spaces. Whether you require office, flex or warehouse space, this 8-building project can accomodate your needs. Spaces are available from 2,700 square feet to 19,700 square feet. 2300 Building Suite A (4,253 SF) 100% first-generation slab space for storage use. 2501 A Building Suite A-5 (5,800 SF) 100% HVAC 50/50 office to warehouse space. 2501 Building Suite C-2 (5,522 SF) Expansive climate controlled warehouse with 4 overhead doors, minimal office area. 2501 Building Suite C-7 (3,565 SF) 2 private offices, storage area, large work room and warehouse with 2 overhead doors, shop restroom with shower. 2501 Building Suite C-11 (2,008 SF) Efficiently configured, 50% office, 50% warehouse, ready for occupancy December, 2018. 4930 Dacoma Building Suite E (2,400 SF) Private offices with large open area for conference or work stations, plus warehouse with overhead door. 4930 Dacoma Building Suite F (2,234 SF) P4 private offices, reception and storage area, plus warehouse with overhead door.